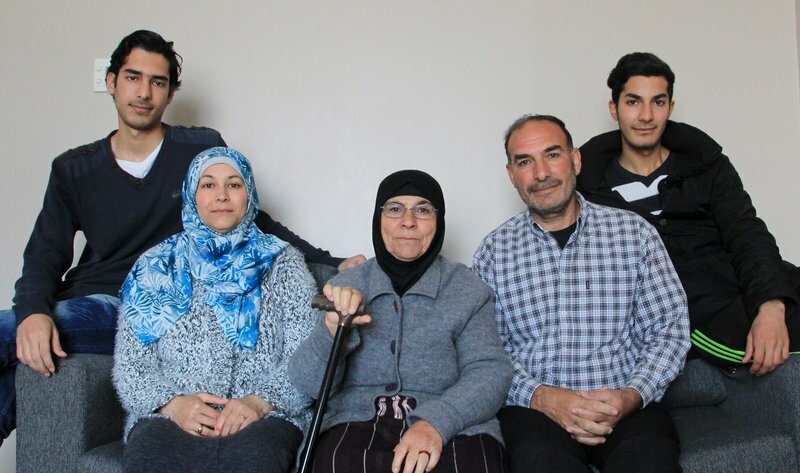 After fleeing Syria in 2014, Mohamad Eid Morad and his family are rebuilding their lives half a world away. Before the war, they lived a comfortable life. Mohamad worked as a contractor and the children went to school. They ended up in Lebanon where it was difficult for Mohamad and his wife Imane to find work. Their sons, Diaa and Ahmed, soon had to abandon their schooling. The family languished there for three years, unable to continue their lives. The family agrees that Red Cross volunteers have made transitioning into life here much easier. They all feel settled and have started to live their lives again. Imane enjoys cooking and lays out a table of delicious homemade Syrian treats - a sweet ricotta filled pancake called Atayef and some Ma'amoul biscuits, along with a pot of Turkish tea - while Mohamad talks about his hobbies. He’s a fan of bodybuilding and swimming. Mohamad says he’s even been invited to play a game of rugby in his local community. The offer’s been turned down; for now. Their oldest son, Diaa, is a keen scientist and wants to study medicine. The 20-year-old is talented; he won a prestigious award called the Syrian Scientific Olympiad before the family was forced to flee. Life hasn’t been without its challenges; language has been a huge barrier for the family. For many of them, English is their third language. Imane and Mohamad have struggled but are attending classes every day and are picking it up. It can also be difficult for Mohamad’s mother, Gazala, who is often left at home alone while the rest of the family are attend their lessons. Without a support network, it can be isolating for her. Their vision for the garden includes bountiful olive trees in the back, a bed of beautiful flowers around the side, and a canopy of grapes over the front. It’s easy to see that this house has become a home for the family. They say they feel much more emotionally settled now and are looking forward to what the future holds.